We are Arts on the Block, a non-profit organization that helps creative youth gain confidence, leadership and workforce development skills through the process of creating public art in their own neighborhoods. 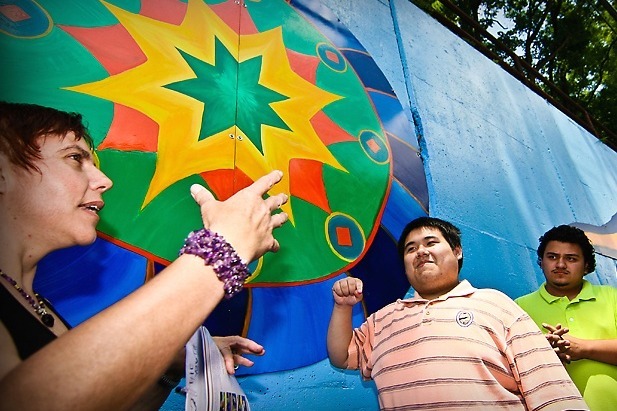 In 2008, teaching artist Carien Quiroga led a team of apprentice artists, along with residents and local organizations, to create the colorful Turning Point Mural -- a symbol of community strength, youth leadership and constructive creativity. The mural is located on a large retaining wall at the corner of Piney Branch Road and New Hampshire Avenue in Maryland, and stands at 4,500 square feet. The community-identified theme of the mural was ‘transformation’ and it was painted with geometric shapes and colors that represents the rich stories of the communities in which it belongs. This year, Arts on the Block received an NEA Challenge America grant to jumpstart community conversations about how to repair the mural. Today, the mural is in disrepair! Some panels of the original artwork have fallen off and the paint is peeling. We also wanted to understand if the theme of the mural is still relevant to community members and how the design might be updated. Throughout the spring, AOB has been hosting meetings with youth. Community members and program partners to plan the restoration of this iconic mural. Your donation will go toward the cost of materials to repair and repaint the mural, such as scraping and power-washing the wall, removing overgrown weeds, renting the right scaffolding and supplies, and reapplying paint. If you live or work nearby, you are also welcome to join one of our community paint days next spring. With your help, we will complete a memorable 10th anniversary project and rededicate the mural for the next ten years. Please support our creative youth as they restore this beacon of community strength!